Hello everyone! I’ve become an affiliate with Pinky Paradise! 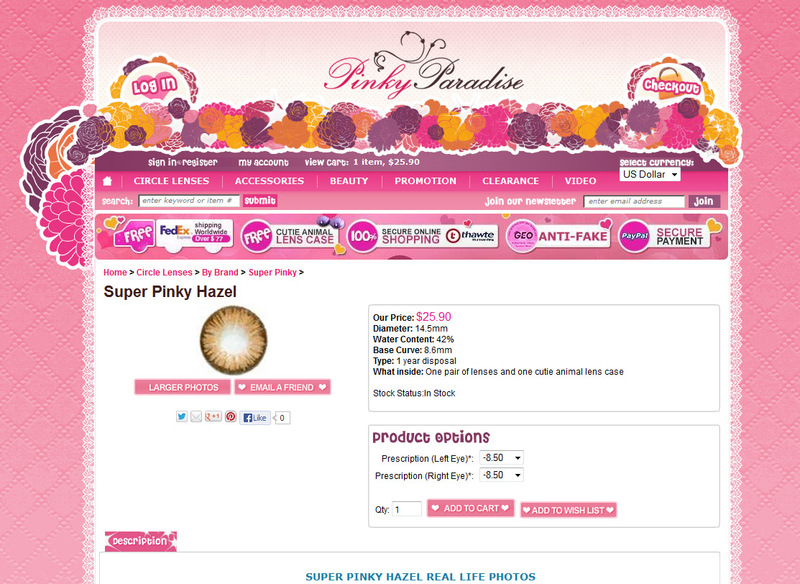 They’re a great circle lens provider with a very easy to navigate website. I am getting my colored lenses there and they even have colored lenses for people with astigmatism (which I have). Currently they have a free shipping promotion for orders over $77. I’ll be writing a couple of reviews of the circle lenses as soon as I get them so look forward to those posts! A screen shot of the website. You can see images of real people wearing the contacts. You can also see that the prescription can go as high as -10.00. Clearly, I’m blind as a bat without glasses/contacts. What are circle lens? Circle lens make your eyes appear larger and come in many colors and/or special patterns. They began in 2004 and are very popular in South Korea, Japan, Taiwan and China. Normal contact lenses sold in the United States have an average diameter of 14mm–16mm. Circle lens have a diameter of no more than 15mm since any larger would be harmful to the eyes. When the diameter of the circle lens is described as 16mm or 18mm, that is only what it appears to be. The difference between the two types of lenses is that circle lens is tinted in areas that cover the iris of the eye, but also in the outer rim of the lens. The result is the appearance of a bigger, wider iris and creates an illusion of large eyes. The middle is transparent and it is large enough to allow clear vision. The lenses are becoming increasingly popular among teenagers, young adults, and cosplayers alike. When you checkout, use this coupon: NeocoolstarCosplay. Click on the picture and start browsing!